Business groups—including the Minnesota Business Partnership and Minnesota Chamber of Commerce—actively cultivate the notion that business taxes in the Gopher State are high relative to the rest of the nation. However, total state and local business taxes as a share of business activity in Minnesota are typical of other states and equal to the national average. According to Ernst & Young’s Quantitative Economics and Statistics practice, “a broad measure of a state’s overall economic activity should be used to determine the measure of aggregate business tax burden that can be compared across states.” To do this, Ernst & Young computes a “total effective business tax rate” (TEBTR), which equals “the ratio of state and local business taxes to private-sector gross state product (GSP), the total value of a state’s annual production of goods and services by the private sector.”* The most current EY “Total State and Local Business Taxes” report† presents TEBTRs for all fifty states and the District of Columbia based on fiscal year (FY) 2016 data. Minnesota FY 2016 TEBTR is 4.5%—identical to the national average. Minnesota is tied with Wyoming for 28th highest TEBTR in the nation. Minnesota’s FY 2016 TEBTR of 4.5% does not reflect the state business property tax reductions enacted during the 2017 legislative session. The reductions in the state business property tax should contribute to a reduced business TEBTR in Minnesota relative to the national average. 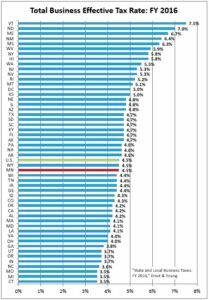 No single measure of business taxes provides a complete picture of the relative level of business taxes in the fifty states. However, measuring business taxes as a percentage of private sector economic activity in a state through the TEBTR is certainly one common sense indicator of comparative tax levels. This indicator—combined with other measures from the FY 2016 EY business tax report, such as the business share of total taxes and benefit from public investments that businesses receive relative to taxes paid—reveal that state and local business taxes in Minnesota are at or below the national average. *Taxes included in the calculation of the TEBTR consist of business property taxes, general sales taxes paid by businesses on purchases of goods and services used in production, a portion of excise taxes (such as “business’ share of motor fuel taxes, alcoholic beverage sales taxes, amusement taxes, insurance premiums taxes, pari-mutuel taxes, public utility taxes, tobacco sales taxes and other selective sales taxes”), corporate income taxes, individual income taxes on pass-through business income, taxes on insurance premiums and utility gross receipts, unemployment insurance taxes paid by employers, business license charges, and severance taxes on mining and other natural resources. †This report is prepared annually in conjunction with the Council on State Taxation and the State Tax Research Institute. ‡The eight energy-producing states excluded from this analysis—identified using various on-line sources—are Alaska, Kentucky, Louisiana, North Dakota, Oklahoma, Texas, West Virginia, and Wyoming. The average TEBTR among these eight states is approximately 4.7%. Removal of these eight states is not sufficient to move the average TEBTR for the remaining states below the national average of 4.5%.